In my last blog, we touched on gratitude and the importance of fostering the connections we make while in school. This idea, seeing connections, cannot be understated. The human brain is powerful in large part because of its ability to see and make connections—be it people, patterns, or thoughts. And while I’d love to toot my own horn about how great the benefits of connection and appreciation are (and they are), I have to counter myself a bit. While humans have always been drawn to the predictive power of familiarity, it is not necessarily to our benefit. We can become entrenched in familiar ways of thinking and acting that do nothing to enrich us. In fact, in evolutionary terms, variation is the goal. I would argue, that while networking helps you find a job, embracing diversification will bring you the greatest success in college and your career. Many of us will stagnate and become dissatisfied when courses begin to rehash the same tired theories we have been covering since freshman year. We are complex, thinking beings. Robots are made for repetition, not us. While there is a benefit to looking at theories from different angles, there is a balance between reviewing ideas and beating a dead horse. If all of your courses are in the same discipline, you will begin to get tunnel vision or worse, tune out to the lessons. So, rather than sign up for one more “easy A,” why not push yourself to try a new type of class. Maybe biology, computer science, or philosophy? They will give you a view of the world that could open a whole new way of seeing things. Tip: Find ways to think about your course work from outside their home academic fields. How does human evolution relate to user experience? What about ethics and business communications? These new neural pathways will make your brain more elastic, agile, and creative . Careers are no longer a straight climb up a ladder. Today, versatility and multi-faceted skill sets are in demand. And that is not a bad thing. The truth is, very few jobs will fulfill your head, heart and stomach. And those jobs that fill you with love, often don’t fill your fridge. As more and more people realize this fact, the popularity and acceptance of modular careers will continue to increase. Use your time in college to gain some transferable skills by broadening your academic focus. If you end up with a career path that jumps around, you will be glad of your diverse coursework. You will have gained knowledge and skill in areas that will become relevant in financial ways. Having a diverse course load will make you a more complete, interesting person. Don’t sell your time in school short by going only for those courses that are required for your degree. If you don’t take the time to explore now, you may never get the chance again. At this point in the school year, most students find themselves full swing on one of the most-dread-of-all class assignments: the group project. We bemoan navigating group dynamics, schedule conflicts, and technology shortfalls. Wouldn’t a simple paper suffice? But remember, you will collaborate in your future career. HINT: Educators create these assignments because teamwork, problem-solving, and communication are requirements in virtually any job. According to the career experts at Glassdoor, many of the soft skills you hone during group work are the exact skills employers look for. Remember last time, when I told you about Facebook CEO Sheryl Sandberg’s policy of focusing on natural strengths? That’s code for soft skills. Working with others will help you succeed, both in class and on the job. Equally crucial to (grudgingly) sharpening our collaboration muscle is remembering to say thank you to our teammates for those ways they contribute to the project. Besides helping you to become a better communicator, they bring valuable alternative views to projects. Moreover, your classmates today may be your coworkers tomorrow. After all, if you are in the same class, you likely have some career goals in common. Why not use these professor imposed connections to forge real world contacts? TIP: Consider group work as networking 101. Studies show that practicing gratitude can change your outlook for the better and help foster a community of people who support each other. Researchers published on the University of California, Berkeley’s site, Greater Good, asked, “Is Gratitude a Moral Affect”? They concluded—yes—gratitude is more than good manners; it motivates and reinforces empathetic behavior in the person practicing and the person receiving thanks. The article noted that “the emotion of gratitude might also have motivational value, prompting grateful people to behave prosocially themselves…[motivating] reciprocal altruism.” In other words, gratitude can start a pay-it-forward-style social movement on campus and in your everyday life. You never know when common courtesy could pay big dividends—in friendship or while networking. So, in the spirit of the season, go out and flex your “thank you” muscle. The Metro State community will be all the better for it. Glassdoor is a site that allows you to search millions of jobs. They have an impressive portfolio of blog topics covering virtually every subject related to careers. Greater Good, hosted by the University of California, Berkeley, offers tips, quizzes, videos, and articles on the human quest for happiness. If you missed my last post, you can find out why knowing yourself is the key to school success here. Writer James Joyce extolled, “A man’s mistakes are his portals of discovery.” It’s great to know it’s okay to try and fail. However, focusing on your strengths can be the actual key to success in the classroom and beyond. Luckily, Metro State’s Career Services Center (CSC) has fantastic resources to help you uncover your talent and channel it into a successful career. As a student, you have access tools like, FOCUS, online assessments created to help you discover careers and majors that use your strengths. You will need to create an account the first time you sign on. Use the access code: “METRO” and fill in your information to gain access to career planning, academic strengths identification, and a multitude of self-assessments. You may find out something you didn’t know about yourself. TIP: Even if you think you have yourself pretty well figured out, you can still utilize assessment keywords as a resume database! Start a file on your computer (or use a notebook if that’s more your style), and copy down all of the skills, strengths, and personality traits. Write down examples of them in your work or school life. Think objectively about difficult situations or mistakes you’ve made. What qualities did you rely on to get past those pitfalls? Acknowledging your strengths can provide insight when choosing a major or a career. When the time comes, integrate those words into your resume, portfolio, and interviews. TIP: FOCUS offers an easy way to create a report from your results, just click on the Review and Print My Portfolio button, toward the bottom of the home screen. Now that you know a little about me, and how I harness my strengths, go find out how to harness yours! I’d love to hear about your strengths and how you use them in the comments below! Tessa Gedatus’ strengths: Activator, Strategy, Ideation, Adaptability, and Intellection. As an older student returning to college after thirty years has been a challenge. Learning how to do and submit class assignments electronically has been a culture shocking experience. Depending on your career prior to returning back to school can make a huge difference in your chances to be a successful student and acquire a degree. I will use my self for an example. Prior to my returning to college i was a furniture mover. I was required to know or use zero social media or electronic communication engines. I did have a Facebook and an E-mail account. These were the extent of my electronic and social media communication experiences. After taking the placement examination i was placed in the classes appropriated from my scores, OK dandy. Where i immediately hit a road block was navigating D2l and understanding the language of the instructions by the instructor. I was clueless and scared to death. But willing to give this college thing a shot. So since that time i have learned how to navigate D2l, write 8 page essays( with supporting references) and even copy/paste, lol. I am 8 credits away from attaining my BA degree in Org Comm. I figured this should be smooth sailing the rest of the way. Well after walking in MDST 485 i realized how smooth was not gonna happen. I don’t know how to Blog, tweet,re tweet or re- Blog. I am hanging on a thread. However i will learn this stuff but for know, Steve Carell says it best for me. My first sighting of Shepard Fairey’s “Hope” poster was at Barbette in Minneapolis. I routinely peruse billboards and I don’t think I hesitated more than five seconds before I unpinned it from the cork board, rolled it up and gently tucked it under my arm. I knew I had a treasure (and besides, there was more than one). The bartender noticed and I had to do a little sweet talking, but I still have that poster, among others. Not all of the posters I’ve collected are political, but it seems that some of the best posters in history have been either musically or politically oriented. 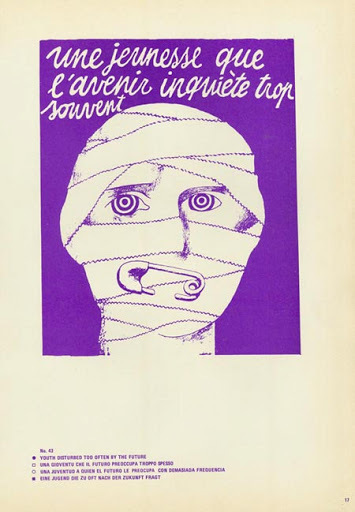 It’s widely acknowledged that the political posters from the Paris Uprisings of 1968 greatly define the genre. I was first exposed to this period of French history through the steamy film The Dreamers, directed by Bernardo Bertolucci and set before and during the uprising. The posters shown briefly in the film piqued my interest more than the NC-17 content did, yet I could only find limited information, most of which was in French. Thanks to the Arab Spring and Occupy, the history of protest and protest art seem to have gained a lot of attention lately. There are all kinds of sources on the net and also a few beautiful new books dealing specifically with the poster art of this brief period. The uprising started with a small student protest and burgeoned into a 11,000,000 worker labor strike- 22% of France’s population at the time. They shut down the country and President Charles de Gaulle’s government was dangerously close to being toppled. 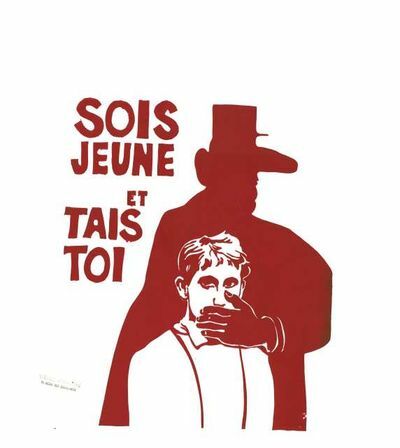 You will often see de Gaulle caricatured as a large-nosed figure (see poster to the left). At the end of the protests, the National Assembly was dissolved and new parliamentary elections were held. The uprising forever changed France- all in two weeks! The posters are the product of a group of art students called the Atelier Populaire (Popular Workshop). They took over the printing studios of their own university and cranked out an impressive volume and variety of posters in a remarkably short time. They switched from lithography to silkscreen because the prior method was too slow– the group often produced over 2000 posters per night. Most of the posters are monochrome, simple in design and direct in message. Posters were chosen by vote within the group and then posted nightly for the public to see current issues every morning. I will never again complain about how much work a social media campaign can be! 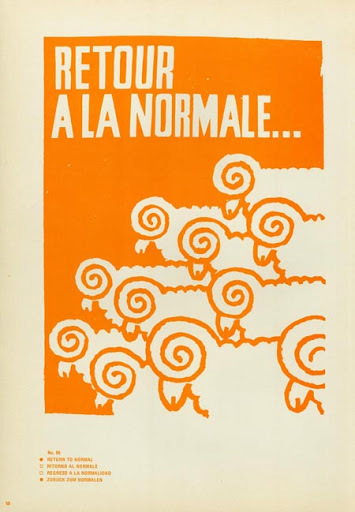 Although Occupy and these students share a common root (Situationist International), there is nothing vague about the poster messages of May 1968. They express anxiety for the future and distrust of authority and the press. They warn and inform of police brutality and call for for unity of the workforce and a better quality of life. They express that merely producing and consuming goods is not a good way to live and encouraged the viewer to believe that so much more was possible. They encouraged people to fight for change. Individual artists never took credit nor signed their work and long after these events had passed, the Popular Workshop refused to put any of the posters up for sale. I’m sure if these students had the media at the time, they would of been gods of Twitter and Facebook. Fortunately the media of the time left us a lasting and powerful record that is still relevant today. Despite the fact that the Popular Workshop would despise and discount me for a bourgeoisie, I would love to have just one of these posters prominently displayed in my collection. Ça, c’est dommage! To view more posters check out Art for Change.